“The bookshelf Kristin designed is easily the biggest focal point of our home,” says Pryce. “It took everything to the next level.” A Sputnik-style light fixture and curved ottomans contribute to this funky take on a library. 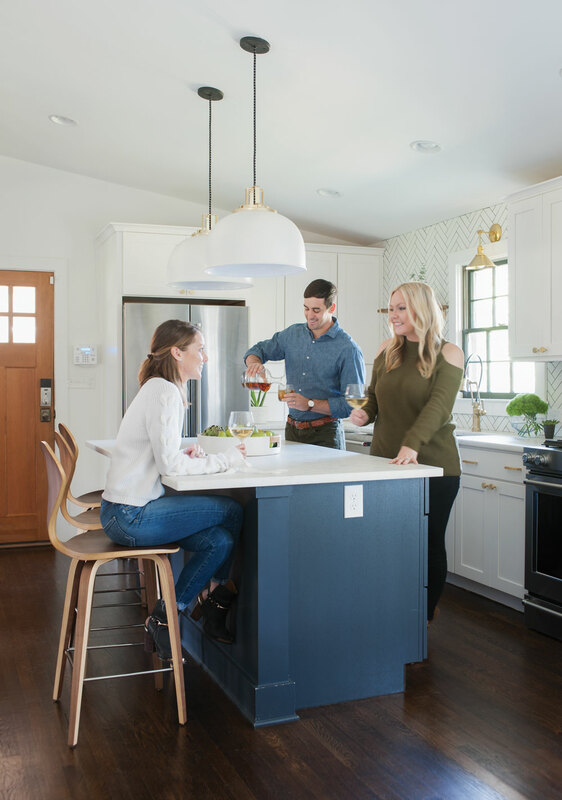 Pryce and Jeremy Jackson are a lucky couple—their Smyrna ranch house needed a lot of work, and they have talented designer Kristin Jackson in the family. 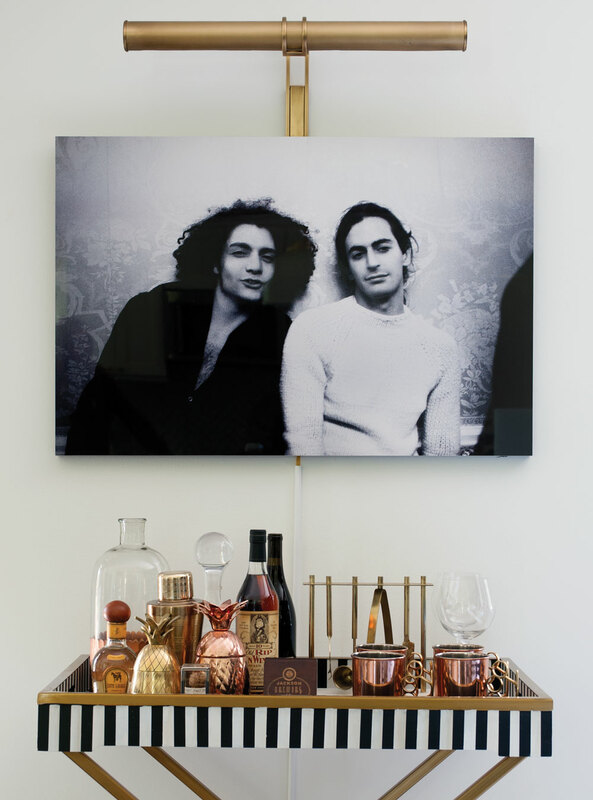 “When we first walked in, we saw it was a time capsule from the 1960s,” says Kristin, Jeremy’s cousin, who pens the popular blog Hunted Interior. “I’m not sure anything had ever been updated, and there was paneling everywhere. Fortunately, Pryce and Jeremy were able to see the potential.” The pair chose Smyrna for its convenience to their jobs and city life. Kristin, in green at right, tackled this ranch renovation with Pryce and Jeremy Jackson. Kristin and Jeremy are cousins. 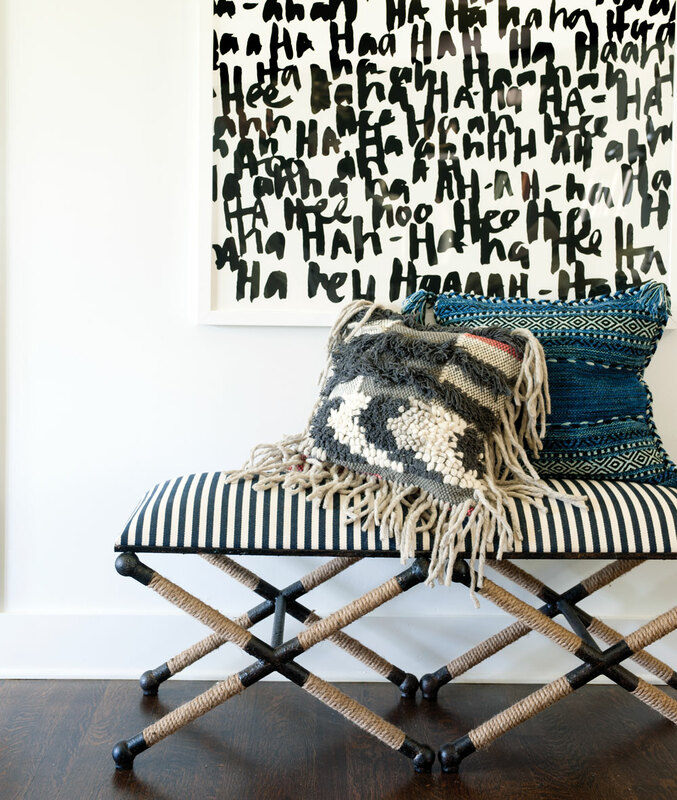 Large-scale art from Minted evokes laughter and epitomizes the fun they had on this project, says designer Kristin Jackson. creating her own acid-washed denim seat covers. Kristin hand-painted this butler tray with stripes and gold trim to serve as a one-of-a-kind bar cart. Above it hangs a behind-the-scenes shot of Marc Jacobs; Pryce loves black-and-white photography. As in a lot of ranch houses, the living room had been one long space, with walls separating it from the kitchen. 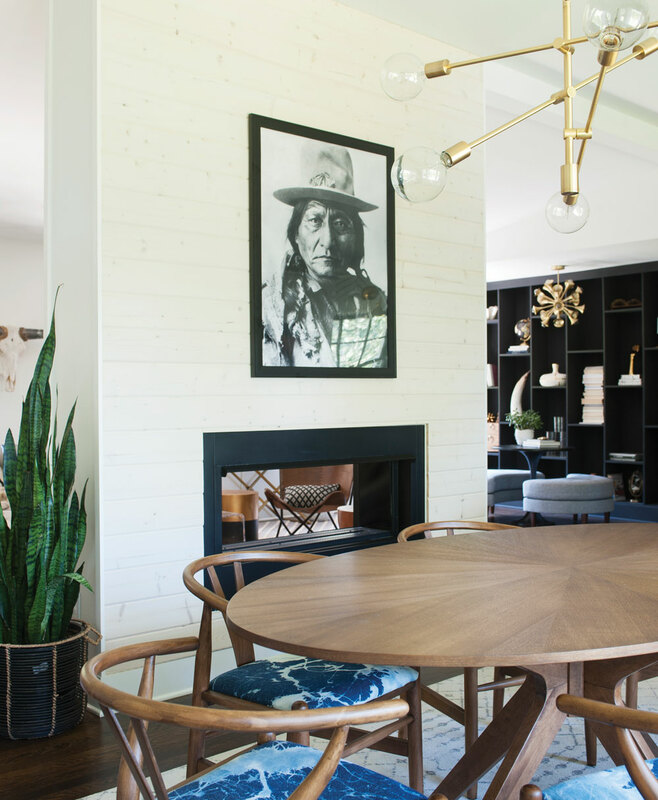 Chad Hamlin of the Hamlin Group removed internal walls and vaulted the ceiling to create the open floor plan. 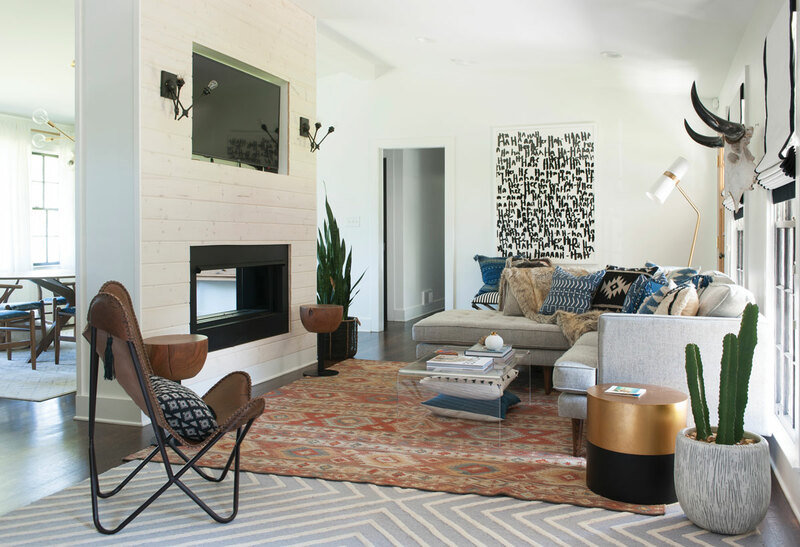 The clever addition of a two-sided fireplace now serves both the living room and dining area. 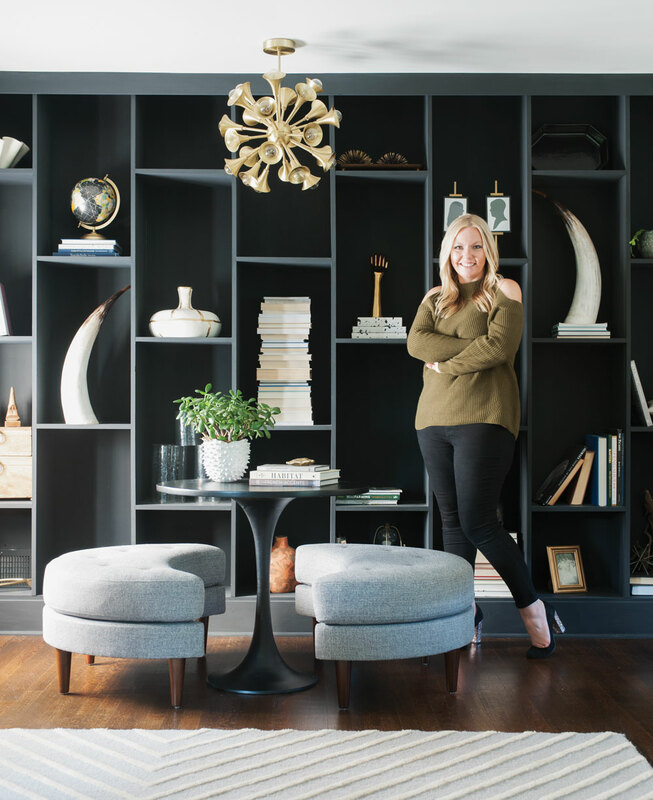 To provide a focal point in the back of the living room, Kristin designed a mod 12-foot-high bookcase and painted it a moody black. The new kitchen—unrecognizable from the dark, paneled original—is now a crisp navy and white. 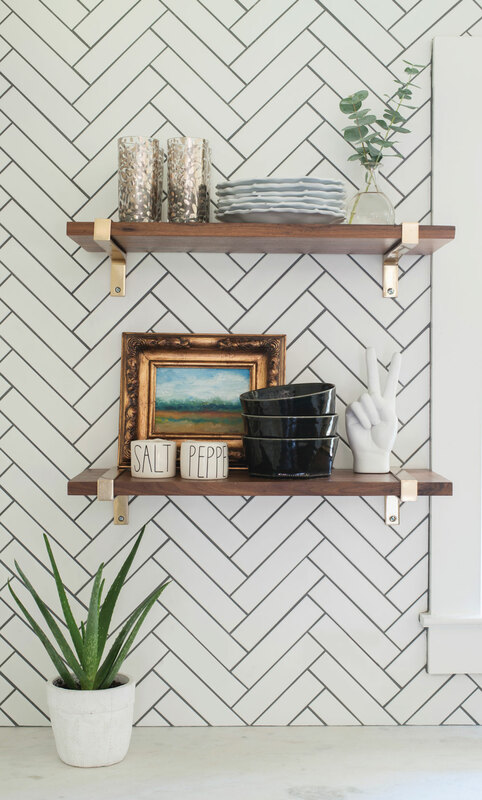 Brass accents and a herringbone backsplash elevate the classic color scheme. 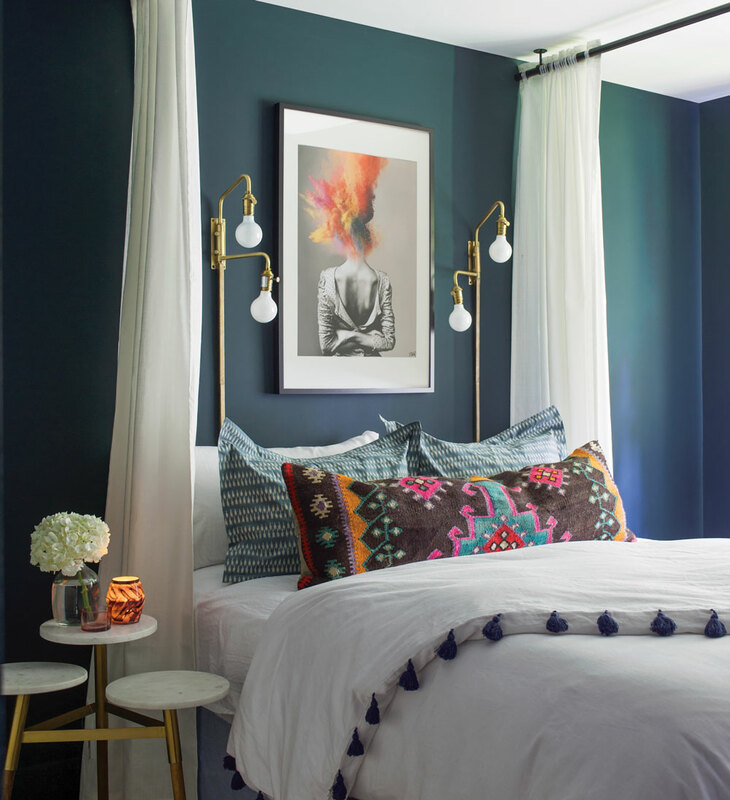 Sherwin-Williams “Cascades” covers the walls in the guest bedroom, a chic space thanks to Kristin’s DIY canopy bed, a bed pillow made out of a vintage rug, and a dresser painted the same color as the walls. “We were going for a boutique-hotel feeling,” says Kristin. 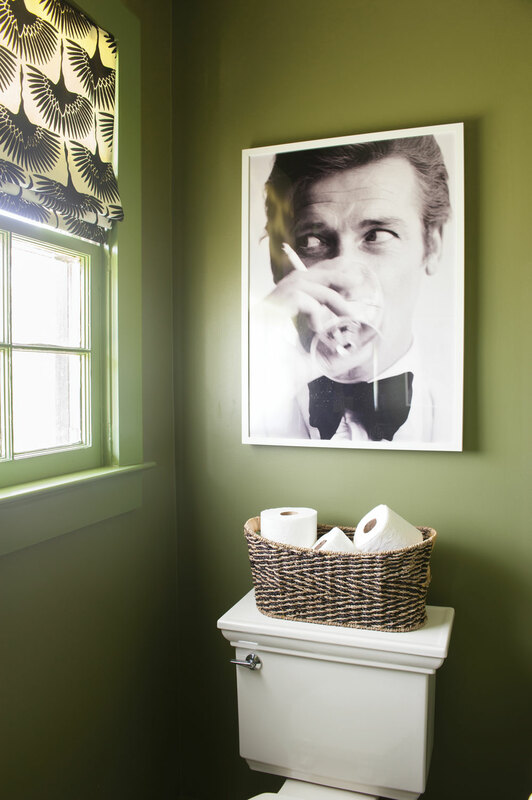 Kristin chose a rich wall color (Pratt & Lambert “Thyme Green”) for the guest bathroom, then designed a custom Roman shade in a coordinating pattern. Interior design Kristin Jackson, Hunted Interior, huntedinterior.com. Contractor Chad Hamlin, the Hamlin Group, hamlingroup.com. Living Room Bookcase paint: Farrow & Ball “Pitch Black,” us.farrow-ball.com. Curved ottomans: Cost Plus World Market. Trumpet light fixture: Etsy, etsy.com. Coffee table: AllModern, allmodern.com. Sectional: West Elm. Aztec rug: Dash & Albert, through Annie Selke, annie-selke.com. “Ha Ha” artwork: artist Kate Roebuck through Minted, minted.com. Floor lamps: Lamps Plus, lampsplus.com. Leather butterfly chair: Wayfair, wayfair.com. Kitchen Dome pendants: Rejuvenation, rejuvenation.com. Counter stool and concrete sink, Wayfair. Cabinetry: Strathmore, strathmoredesign.com. Cabinet hardware: the Hardware Hut, thehardwarehut.com. Dining room Table: Article, article.com. Rug: Rugs USA, rugsusa.com. Light fixture: West Elm. Chairs: Cost Plus World Market. Guest bath Wall paint: Pratt & Lambert “Thyme Green,” prattandlambert.com. Roman shade: Tonic living, tonicliving.com. Pedestal sink: Kohler, kohler.com. Guest bedroom Sconce: Cost Plus World Market. Tassel duvet: Ballard Designs, ballarddesigns.com. 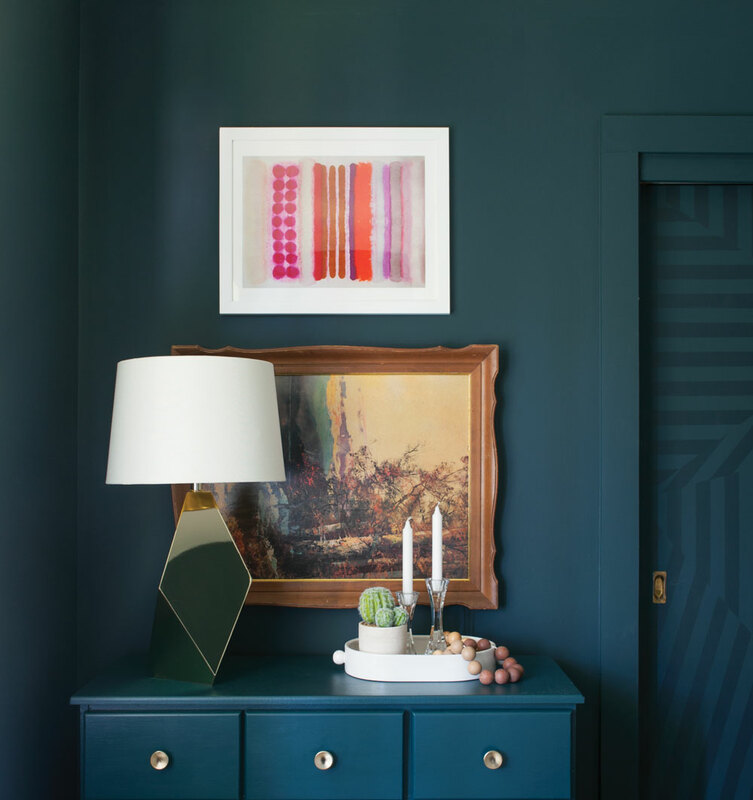 Wall paint: Sherwin-Williams “Cascades,” sherwin-williams.com. This article originally appeared in our Winter 2017 issue of Atlanta Magazine’s HOME.